"Blue Hair Studio was a most challenging job. 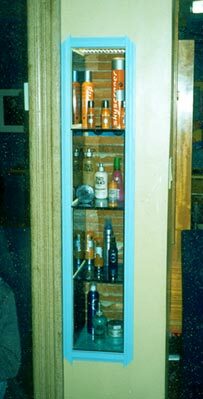 One aspect was to create space where there wasn't any and to create a despenser for hair care pomaids to be made out of the door of an antique cigarette dispenser. First, after a bunch of drawings and designs for shelves of some kind I realized that the main obstruction in the room was hollow. I made a recessed shelving unit constructed of translucent-colored plexyglass which I lit from the top. This allowed the light to shine through all the shelves creating a display for hair care products that can not be ignored. The illumination and the colored, mirrored and glittered plastic components fastened inside a painted wood box with no back that kept the plaster and lathe exposed as the back round. 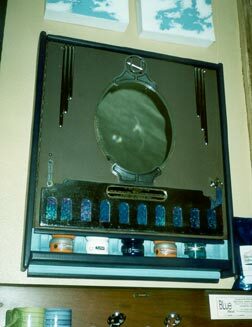 A greater challenge was to design a despenser for hair pomaid using the antique cigarette machine door (see below). First, I had to restore the door. I removed all the parts and polished the chrome, blackend the recessed lettering, etc. Then, I designed and built a wooden segmented case that allowed for a pile of the product to be loaded in and as one was pulled out the next one would drop in it's place. Next, I painted it to match the salon décor. To attach the door I created a locking mechinism. When the product reps. come to sell their stuff they're amazed at the extent taken to display the products. Un-conventional, but so much more appealing to the customer and reflects the glamour of the hair care industry.